Here in this Great Biking Day photo we caught a Penn Cycle team member making tracks on Buckhill, near Lakeville, MN, at the last Thursday Evening mountain bike event there for 2016. Each year, since 2011, the Buckhill Thursday Night at the Races brings together beginner, intermediate and advanced mountain bikers for some fun times. This family friendly event is also a great opportunity to get the younger ones into mountain biking with a free kid’s race after the adult races. See more places to bike and fun events in the new Minnesota Bike/Hike Guide. Thanks for viewing the Great Biking Day Pic of the Day here at HaveFunBiking. 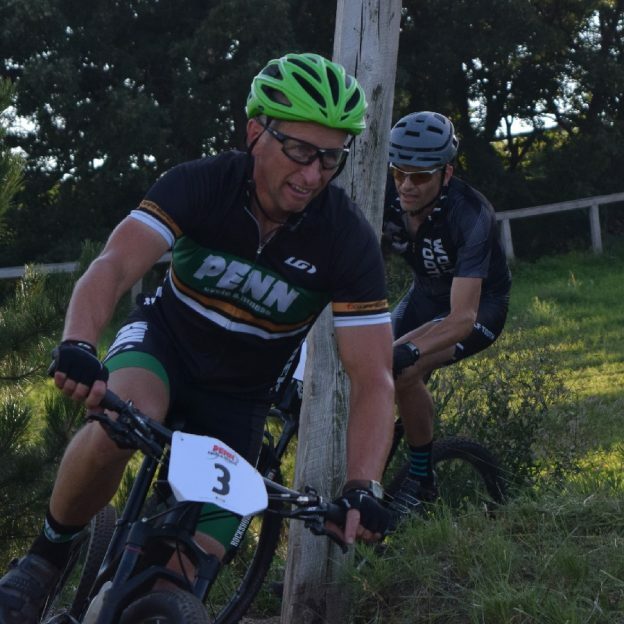 This entry was posted in News, Picture of the Day and tagged #nextbikeadventure, #onlyinMN, #penncycle, #thursdaynightat the races, Buck Hill, HaveFunBiking, Kids races, Lakeville MN, MN High School Cycling League, Penn Cycle, Thursday Night at the Races on September 3, 2016 by Russ Lowthian.